As with any James Bond actor post "Diamonds Are Forever", Daniel Craig was understood to have been offered the standard contract of 'three films plus the option of a fourth' (meaning the actor has first refusal on a fourth movie). This was rumoured to have been re-negotiated after the record-breaking success of "Casino Royale", taking him up to Bond 25. Now, on his third outing as 007 with "Skyfall" (Bond 23) filming underway, producer Michael G. Wilson has told The People newspaper that he would love for him to become the longest running actor in the role - a record currently held by Sir Roger Moore with seven official films. "Daniel’s been a terrific Bond, a superb actor and a terrific man. The fans love him and I don’t think there’s a better actor to play the part," Wilson told the paper at last Monday’s premiere of 'The Girl With The Dragon Tattoo'. On the subject of extending Craig's contract, he said: "It’s certainly something we’ll be discussing with him once we finish shooting Skyfall." "Filming has gone very well so far and I’d love Daniel to surpass Roger’s record and do eight pictures. Daniel’s been an absolute pleasure to be around because he takes the role so seriously. There’s really no one more passionate about making these films work than him – he’s a film maker’s dream." "A lot of people have said Daniel’s been their favourite Bond since Sean Connery and I can’t argue with them. He’s doing a great job." MGM and Sony are already penciling in Bond 24, which would be Craig's fourth movie, for the Holiday 2014 season, leaving a two year gap between films. Assuming the most aggressive schedule with no hold ups, that could see Bond 25 in 2016, Bond 26 in 2018, Bond 27 in 2020 and what could be his eighth - Bond 28 - in 2022 when Craig would be 54 years old. 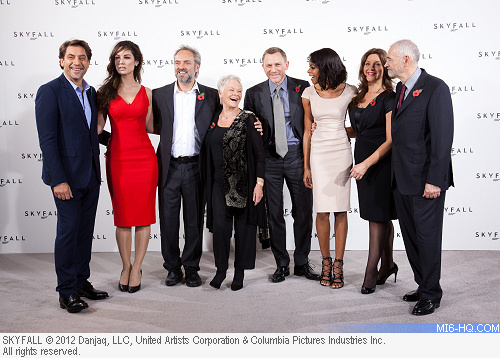 Above: Producer Michael G. Wilson at the "Skyfall" London press conference last month. 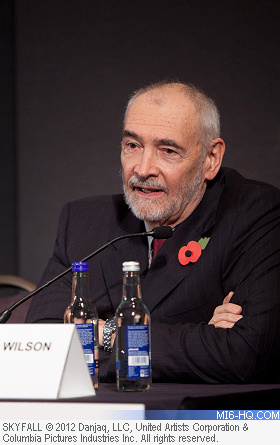 In comparison to other actors, Pierce Brosnan departed the film series at age 51, Timothy Dalton was allowed to leave his contract early due the protracted six year legal hiatus after appearing in "Licence To Kill" at age 43, Roger Moore bowed out age 58 (he is older than Sean Connery despite starring later in the series), and Connery wrapped "Diamonds Are Forever" at age 41. He returned for the rogue production "Never Say Never Again" aged 53. Craig himself has said that he is happy to continue in the role as long as he feels physically fit enough and the quality of the films hold up. Perhaps more than any other actor in the role before him, Craig has also had the opportunity to star in high-profile movies between 007 duties. He is understood to be earning £8 million for "Skyfall". On the subject of the new film, Wilson said, "The director Sam Mendes and Daniel are taking it back to a 60s feel – more Sean. I think that’s what the fans wanted. There’s a magical "Goldfinger" feel surrounding it all. It’s all very exciting. I can’t wait for people to see the movie because I think we’re making a very special Bond."